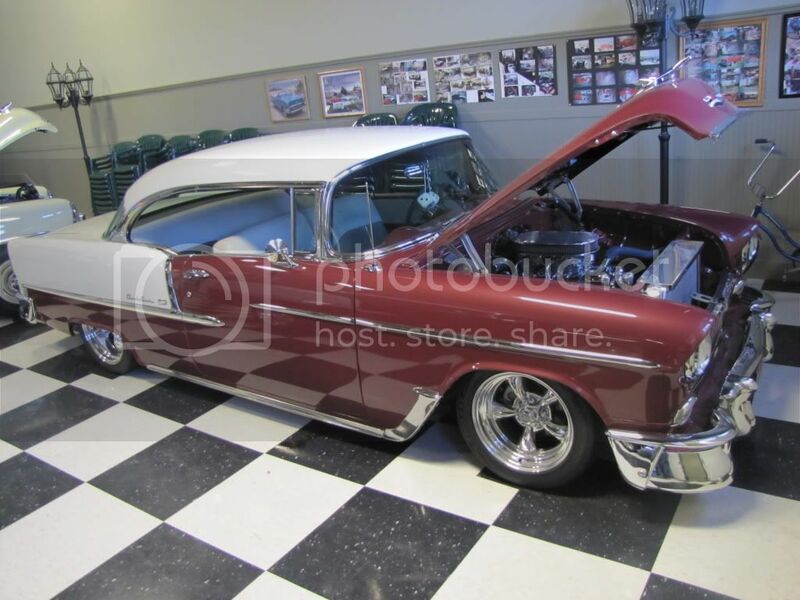 Location: Main Index » Forum Index » 55-57 Central » The Nomads » Thinking of putting a Ford Nine inch rear Differential in my 55 nomad! 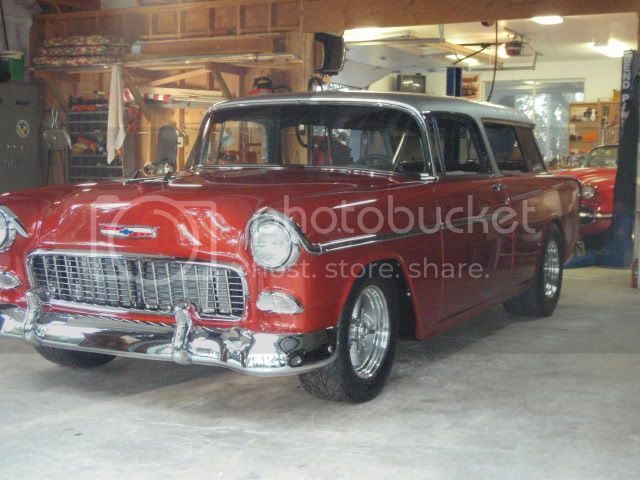 I have a 9" that I built for my '55 Nomad. I also put on rear disc brakes. Unfortunately, it's at a different shop getting metal work complete. 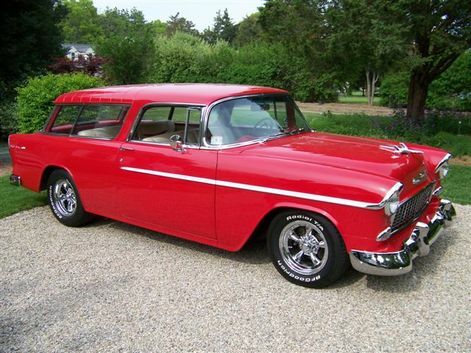 You can see my post on the forum as '55 Nomad second time build. I'm running the MT 12" wide tires in the rear. They look great and I didn't have to tub at all. I ordered 15" x 10" wheels with a specific off-set. When I go back to the car this week, I'll take measurements and get them to you. Do you have the original tank in the Nomad? If so be careful with the 9". Some housings come close to the flange on the front of the tank, and some owners have bent that flange to give a bit more clearance. I think the rear end that fits best is the early round back housing - others may chime in with more info. This chassis is under a 55 2dr Wagon. The rear end is from a 57-58 Ford wagon or Ranchero. It is 58" wheel mounting surface to mounting surface. I can just fit 295/50-15 tires in the rear wheel wells. Should be no problem with a Nomad. Good job! I see you're running the leaf springs into the pocket frame as well! The following dimensions are what I worked out for the Nomad. The total width (face of rotor to face of rotor) is 57 5/8". The back spacing of my 15" X 10" rims are 4 3/4" from the outside edge of the rim. This measurement is taken from the back of the rim. Also, I did utilize the leaf spring pocket kit for the frame. This places the leaf springs in line with the frame rather than the original location of being mounted on the outside of the frame. This allowed me to put the Mickey Thompson 12" wide tire on the rear. thanks for the info! this will help me with my wheels and tires!!! Cashboy! 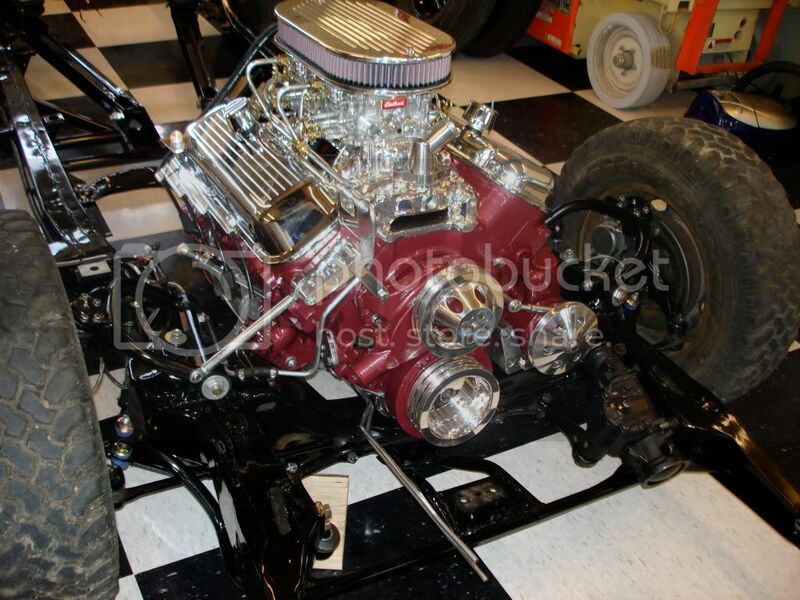 Below are photos of 58" wide Ford Granada 9" rear-end in one of my 55's. I moved the springs to under the frame rails and used 10" wide wheels with a 4&7/8" backspace. Worked well and did not rub. I used a similar Lincoln Versailles axle, 58-1/2" wide, along with a pocket kit to move the springs under the frame and a 2-1/4" mini tub. With a tape measure and a calculator you can calculate all your clearances and decide what your wheel backspacing should be. Or there is a wheel/tire calculator spreadsheet out there for our cars which has the math built in. A search might turn it up, as it was originally posted on this site. Is that steel wool in the exhaust megatip? Does it help cut some of the drowning noise in the exhaust? No there was no steel wool in the exhaust tip, it was just the inside of the exhaust tip. The car had an absolutely great sound. With the burgundy 55 below, I have really struggled with the sound. 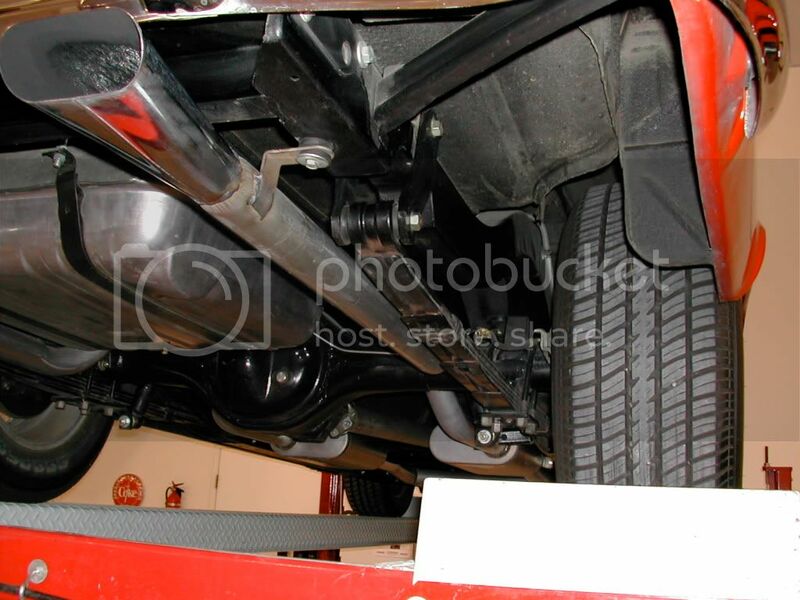 As you can see from the photos of the frame below there is almost no place for mufflers. It has mufflers right at the back of the headers and 5 1/2' of cambered pipe on each side and still has a sound that I don't like. Very pretty car but very frustrating. Edited by Jim McCall on 03-13-14 10:55 AM. Reason for edit: No reason given. you have to be very sure of the rear of the 9" housing. cars are different than wagons because of the gas tank. so what may fit nice in a car will not fit nice in a wagon. since there is no easy way to alter the gas tank, the housing must be positioned just perfect. I used a housing from a 59 Merc wagon. and since my Nomad is a race car, I have it as low as I can get [within reason] I ended up making my own spring pads and moving the housing ahead 3/4" on the pads and it clears the tank just right. 9" housings have different shapes. so spend some time checking before start welding things in permanent. Thanks GUYS FOR YOUR HELP!!! I will let you know how it comes out!!! I realize that I am a little late getting into this, but..I have a 58" wide 57 Pontiac rear under my Mad. The springs are in the stock location and have been replaced with 3" lowering springs. I am running a 275 60 15 Tire on a pair of 15 X 8 American Hopsters( 4 3/4 BackSpace), and the only rub that I get is coming out of my fairly steep curved driveway. 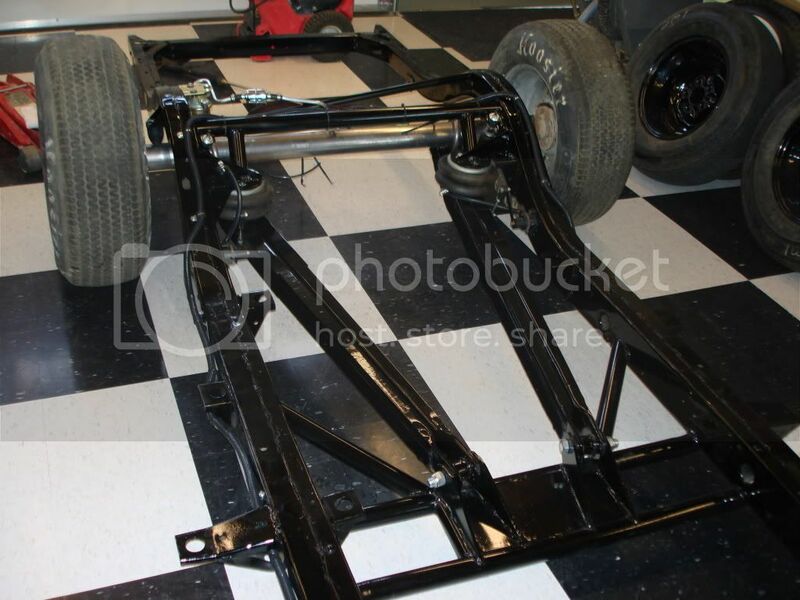 The 58" wide rear fixes the aggravation of getting the rear wheels off of a tri-5. To put the 15 X 7's with 275 60 under my 55 with a 60 1/4" rear, I had to drop the shocks and deflate the tires...what a pain. No problem with the 58" rear. 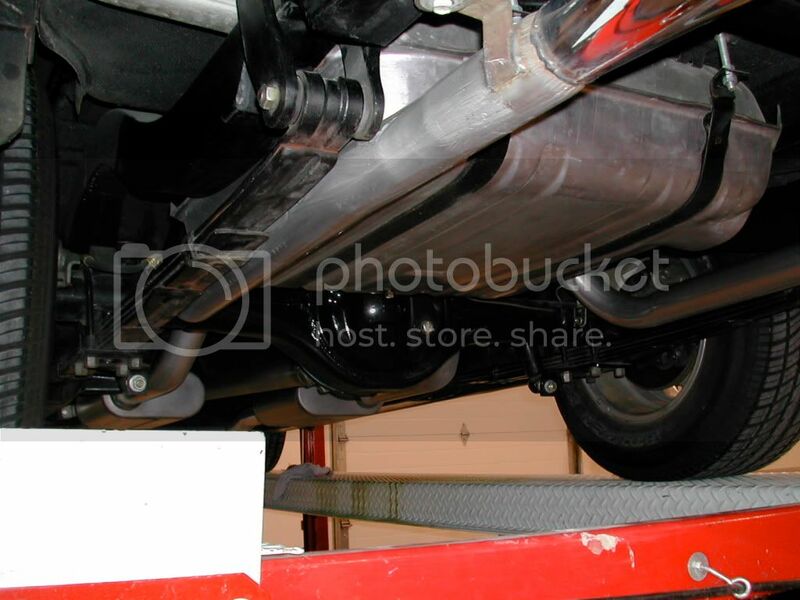 As to exhaust, I am running a 2 1/4" system with block huggers (big block engine) stock type mufflers and an "H" pipe. It is too loud for me. I have picked up a pair of Edelbrock stainless 16" Turbo style mufflers and I plan to install them along with 12" glasspacks toward the rear to quiet it down a bit. I still contend a Crypsler 8 3/4" is best. Even the stock Chevy brake cable looks like a match! oh well. Just an OBTW: original tanks and aftermarket have very close fits between tank and differential. Bending the flange takes some effort!